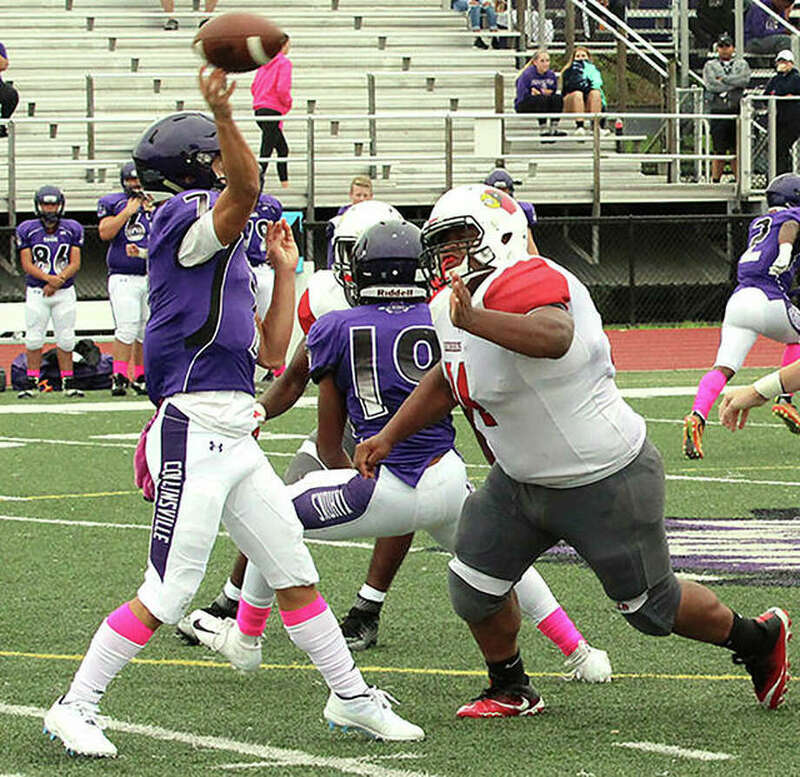 ALTON – Fifty yards in penalties and one punt from seven possessions kept the Alton Redbirds from a perfect first half of football Friday night at Public School Stadium. But coach Eric Dickerson conceded Alton’s 45-9 victory over the Granite City Warriors represented a nearly complete performance from the Redbirds. Alton sophomore running back Tim Johnson split the heart of Granite’s defense for a 56-yard touchdown run on the Redbirds’ first offensive play. Johnson would add TD runs of 29 and 26 yards on his way to 194 rushing yards on 13 carries that put him within 84 of 1,000 for the season. His work night was finished at halftime with the Redbirds leading 45-3 and bringing a running clock for the second half. Even with most starters on the sidelines, Alton still made plays on defense. With the Warriors set up first-and-goal at the 3 early in the fourth quarter, the Redbirds got tackles for loss from Damarco Stewart, Damien Jones and Ihzel Brown to keep Granite out of the end zone. They were following the tone set by Alton’s defense from the opening kick. Granite, which came in averaging 7.8 yards per carry and 276 yards rushing per game, had 26 yards offense in the first half. The Warriors finished with 85 yards offense, including 24 rushing yards on 30 carries. Alton controlled the point of attack with linebackers Charles Miller, Izeal Terrell and Terry Walker hawking the football behind a line rotation of Brown, Kyle Hughes, Teiji Walker, Donovan Porter, Tristan Underwood, Michael Green and Armonte’ Miller. Walker made the unit’s biggest play, pulling off his rush and intercepting Granite QB Freddy Edwards’ screen pass and returning it 30 yards for a TD and a 28-0 lead late in the first quarter. Great summed up the night for the Redbirds, who improved to 5-3 and unofficially clinched a playoff berth for the second straight season. The playoff points – total victories by teams on your schedule – are projecting at 37 for the cut to advance and Alton’s current 40 figures to rise as high as 46 by the time postseason pairings are released Saturday. Alton will close the regular season back home Friday against Southwestern Conference champion East St. Louis. The 6-2 Flyers’ two losses came against powerhouses from Michigan and Ohio. An Alton upset could force East Side to share the SWC title with Edwardsville. Granite City’s playoff fight goes to Galesburg and a Week 9 clash with a 1-7 Silver Streaks team added to the schedule after the Warriors opted to flee the SWC. Granite is 4-4 and must beat the Streaks to get playoff eligible at 5-4 with playoff points that project at 40. The Warriors, who last made postseason in 2011, are hoping to have Edwards back at QB after he left with a hit to the head early in the second quarter and Alton leading 35-3. Edwards, a dual-threat junior, came in at 1,037 passing yards with nine TDs and one interception, while averaging 9.6 yards per carry on 1,147 rushing yards. Edwards left Friday with 10 yards on four rushes and was 0-for-5 passing with an interception. It was the level of play from the Redbirds that Dickerson had been waiting for. Operating behind a front five of seniors Green and Porter, juniors Kyle Hughes and Jayme Copeland, and sophomore Underwood, Alton’s offense piled up 360 of its 393 yards offense by halftime. After his one-play, 56-yard scoring drive to open the game, Johnson answered with a two-play, 72-yard scoring drive before other Redbirds offensive weapons joined the onslaught. QB Drew Jones had TD throws of 7 yards to Walker and 4 yards to Lonnie Tate while completing 6 of 8 passes for 123 yards. Ahmad Sanders had a 54-yard reception and Moory Woods had a 42-yard reception. The rout of Granite marked a goal achieved with playoffs all but guaranteed, but East Side became the Redbirds’ focus by Saturday morning. Get key announcements and game updates from the official Alton High School athletic calendar!